The Belgian striker has had an impressive start to life at Old Trafford and does not see any reason to fear the veteran’s return to action. ROMELU LUKAKU HAS no fear about battling Zlatan Ibrahimovic for a spot in the Manchester United line-up. 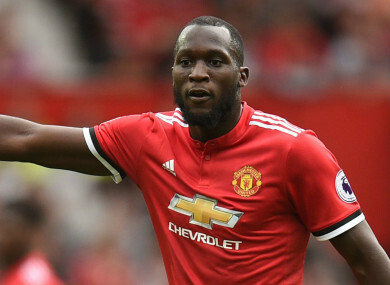 Lukaku has made an impressive start to life at United since his move from Everton in a reported £75 million deal, scoring four goals in as many appearances. However, he will have Ibrahimovic trying to take his place in the team when the Swede, who re-signed at Old Trafford on a one-year deal last month, returns from a knee injury in January. But the Belgium international is not concerned about losing out, expressing his delight to have a player who has won 31 trophies during an illustrious career in the squad. Asked if competition with Ibrahimovic could help him improve, Lukaku told the BBC: “Of course. You don’t fear the competition, you relish it. “As long as it can make you better, make you win, you relish the challenge all the time. “I think it [Ibrahimovic's return] is really good for the team. It’s good to have another guy in the team that’s hungry to win trophies, that’s what we want at Manchester United. At Old Trafford, Lukaku is playing under Jose Mourinho, who sold him in 2014 during his second spell in charge of Chelsea. However, the 24-year-old is excited to have the chance to work with the Portuguese again. “I wanted to play for him since I was 11 so when you get another chance like that you don’t turn it down and I’m really grateful for the second opportunity,” said Lukaku. “He’s always been the same; a man that wants the best out of the players every day. He doesn’t give the players time to rest on the pitch, he really wants everyone to fight on the pitch and in training and that’s what I like about him. Email “Lukaku: I don't fear Ibrahimovic competition, I relish it”. Feedback on “Lukaku: I don't fear Ibrahimovic competition, I relish it”.